Daylight Savings Time ends on November 6: it’s time to set your clocks back again (those that aren’t set by radio or internet signals). So we’ll get a little more evening time to observe this month. And that’s handy, because Mercury hangs in the early evening sky most of the month – and it’s not alone there. It sits near Venus for the first two weeks, with Antares joining the pair on the 9th and 10th. Mercury’s been in the news lately: the Messenger spacecraft team published an article last month revealing that the smooth plains covering 6% of the planet’s surface are flood basalts, volcanic features much like the dark maria we see on the moon’s near side. They were most likely caused by lava oozing rapidly out of cracks in the planet’s crust. The lava flows fill craters more than a mile deep in some spots, and their total area corresponds to about 60% of the area of the United States. Curiously, last month also saw reports from the Dawn mission team of basalt lava flows on the surface of asteroid (4) Vesta. Some people are calling Vesta “the smallest known terrestrial planet” as its structure and geology seems increasingly earth-like. So you’ve read the news reports, you’ve got your magnification cranked up on Mercury and all you can see is a little gibbous disk? 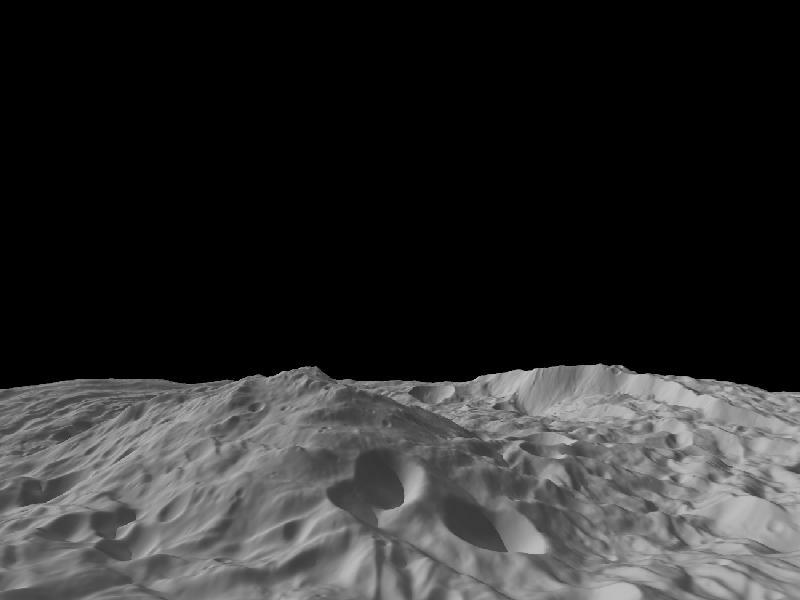 Or you’re looking at Vesta and all you can see is a point of light? Wish you could see what those lava flows really look like? Fortunately, you can! You can see some great examples of “ghost craters”, once-deep craters now filled nearly to the brim with flood basalt lava, in quite a few places on our moon. Mare Humorum is a good place to start looking. It’s on chart 52 of Rukl’s Atlas of the Moon, and should be visible on the night of November 6. And while you’re in the area, just south of there is Capuanus, the “bear paw” (Rukl chart 63), another interesting filled-in “ghost crater”. It’s called the “bear paw” because of the claws extending from it. Take a look – you’ll see! Another excellent flooded lunar crater is Fracastorius (Rukl chart 58), a lovely horseshoe crater rim with a smoothly filled floor. It makes a nice sight at sunrise with its neighbor Piccolomini. Try them on Halloween or on November 29, then check again the following day and see how the view has changed. If that’s not close enough, pack a bag, get in the car and head north. The nearest examples of flood basalts are much closer than the moon: the Modoc plateau, in far northwestern California, with its flood basalts from 17 to 6 million years ago. Or go a little farther north and explore the huge “scablands” of the Columbia plateau of eastern Washington state. The Columbia river carves its gorge through layers of flood basalts, and as you follow the river upstream you can see more evidence of those flood basalts, and how they were scoured and carved by later floods of water when the ice age glaciers melted. Meanwhile, back on Earth: Mars and Saturn are visible at dawn, while Uranus and Neptune are both well placed for evening observing. Pluto has gotten too low for anyone but the most dedicated Plutocrat. But the real star of November nights is Jupiter. I wrote last month that this should be an excellent Jupiter year (weather permitting, of course). The giant planet is only a few days past opposition as we move into November, and since it’s relatively far north – transiting as high as 65 degrees – maybe some of you were able to show it to the kiddies on Halloween. But for your best views, you’ll want to stay up later in the evening, past when the trick-or-treaters go to bed – around midnight or a little before, when Jupiter is near its transit. This year we’re lucky to have Jupiter unusually close, and its disk will span almost 50”. In comparison, less favorable oppositions may show Jupiter under 30”. The mysterious South Equatorial Belt (SEB), which went missing sometime last year, seems to be back now, and Jupiter looks much more normal now. It looks like this year there’s plenty of turbulence in the wake of the Great Red Spot, plus some very prominent dark “barges” in the NEB, and some smaller, flatter barges farther from the equator in the Northern Temperate Belt. Lots of detail to see this winter, if you manage to get steady skies.